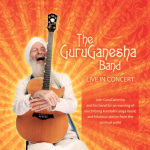 Editor’s Note: This is the first of a two-part interview with GuruGanesha Band. You can also read Part 2, where they share an uplifting video documenting their creative process, as well as their life passions that allowed for the creation of this powerful album. 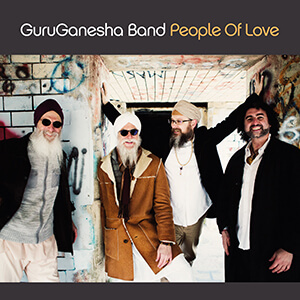 After jamming out to GuruGanesha Band‘s new album People of Love, we are moved and motivated to get up, chant, dance, and spread love to all those we come in contact with! This work of art is unlike any of their previous music, and you will notice the difference upon first listen. Their joy, devotion, collaboration, and new direction groove in and out of every lyric and melody. We caught up with the guys to hear all about the making of this album that is truly a labor — and mantra rockin’ party — of love! GuruGanesha Singh: In these troubled times, we look to find a way to live for each other. This music is a reminder that all of us together are the “People of Love.” I’m talking about unconditional love for all beings. The band is committed to creating opportunities for people to come together, to show each other that we care, to meditate and pray together for all of us, for Mother Earth, to sing together, to chant together, to dance together. In the midst of all the division and negativity, the rise in our country of exclusion, the scapegoating of “others,” Yogiji’s affirmation that “We are the people, the people of love, let us people love today” kept running through my mind over and over. We were inspired as a band to create new rockin’ music to amplify that message, to keep reminding each other who we are at the core, to not give in to hate. “We are one family” is the message! Gurusangat Singh: As a producer, I wanted to create a recording that represented the sound of the GGB as we were experiencing it after 2014. We always sounded a little more Rock ‘n Roll, a little more exuberant live. As we began working on the songs, each band member seemed to bring a unique perspective or inspiration to each track that pushed it forward in an exciting, effortless way. As a yoga teacher and long-time meditator, I was inspired to work with my like-minded friends to create music intertwined with my spiritual path. Something special always happens when GuruGanesha Singh, Sat Kartar Singh, and I are singing mantra or kirtan together. 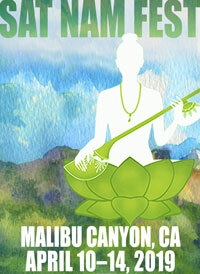 GuruGanesha: GuruGanesha Band is a band in the truest sense of the word. Creating the album and each track on it was the ultimate collaboration. We sought and achieved consensus amongst ourselves on every decision, small and large, taking the extra care to be sure that each of us felt good about every aspect of every song, I believe, makes each song exponentially more beautiful. Check it out for yourself! On a personal level, this album represents my peak performances as both a guitarist and vocalist, I have a feeling that both Sat Kartar Singh and Gurusangat Singh feel the same way about their own performances. Sat Kartar Singh: People of Love is the product of a radically different approach. Rather than featuring a guest female vocalist like the previous outings, PoL is GuruGanesha, Sat Kartar and Gurusangat‘s singing. Together, the three of us painstakingly arranged and produced our sound, song by song. Gurusangat: We tried to keep it kind of close to what we are doing live right now, without too many guest artists or additional instrumentation outside of the band. Much of the older GGB catalogue , with the notable exception of the live album, was was created and arranged in close collaboration with producers who were outside of the band. This time we kept it in the family! 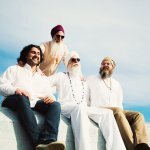 GuruGanesha: One morning in February, Gurusangat, Sat Kartar, and I were sitting at Gurusangat’s kitchen table in Brattleboro, VT, sipping piping hot cups of yogi tea when we were moved to write some lyrics and melody to a beautiful new chord progression that Sat Kartar was strumming on his acoustic guitar. We had just been watching the news on CNN, and it felt like the early 70’s all over again. We decided that People of Love needed to speak directly to the frustration, pain, and confusion that many of us are currently feeling. We also made certain that the second half of the song included a prayer and positive affirmation that we hope will be a forklift to listeners’ spirits. 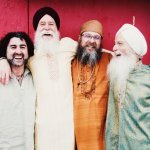 Sat Kartar: Last winter, while recording in Brattleboro VT, Gurusangat and I were sitting on the floor of his recording studio laughing about something. We are often brutally honest with each other and so we got to talking about the English verse of our Mul Mantra track. Turns out we both hated the lyrics we had been singing, so we started re-writing them and worked at it until we were happy with the result. It was great to collaborate in that moment to make something better. Gurusangat: 50% of this album was recorded in GuruGanesha’s guest room! Is there something that your fans would love to know from the making of this album? GuruGanesha: The song “The Soul Within” was inspired by a Rumi poem and provided me great solace and emotional pain relief when I was laid up in early 2016 with a badly broken left knee cap. I’ve been sending the recording to friends and family members who are going through extremely difficult times in terms of their physical and emotional health. The messaging and music seems to be easing people’s pain. Sat Kartar: The album was recorded in Virginia and Vermont over the course of a year. The process was fun and full of moments of laughter and a few challenges. GuruGanesha fell and broke his kneecap which was surgically repaired. I fell off my roof on Election night and broke my back right before GGB was scheduled to perform at Sat Nam Fest Mexico 2016. We have kept up through it all and are proud of this album. 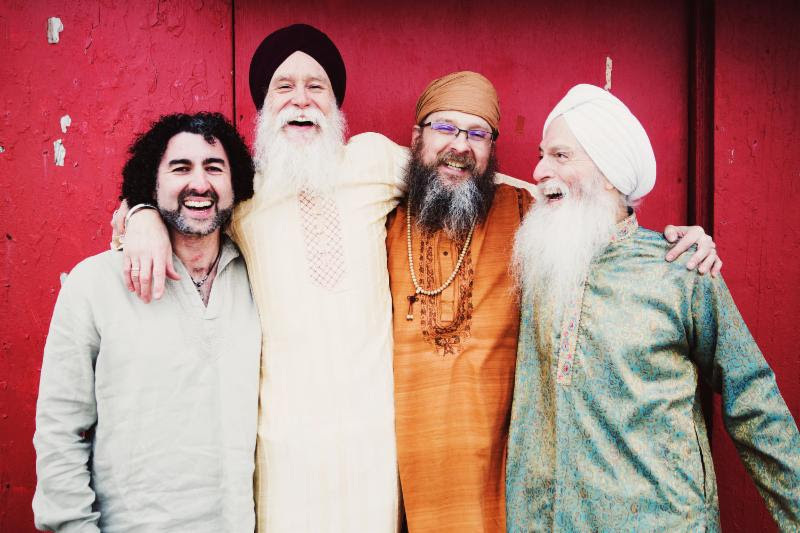 Learn more about GuruGanesha Band’s new album in Part 2 of our interview.